Empyema thoracis (pyothorax) is due to pus accumulation in the pleural cavity, which when neglected could be life-threatening and has been implicated as a major cause of death in severe odontogenic infections. Empyema thoracis of odontogenic origin is an extremely rare condition. It occurs almost invariably as a consequence of descending spread of odontogenic infection. Regardless of its origin, it is associated with severe morbidity and high mortality rates., Empyema thoracis of odontogenic origin is an extremely rare occurrence. We report a case of empyema thoracis of odontogenic origin. A 32-year-old male cattle herder presented at our clinic with a 2 weeks history of persistent toothache, 8 days history of inability to open the mouth, 5 days history of an anterior neck swelling which had increased rapidly in size, and 3 days history of unproductive cough and breathing difficulty that worsen on lying supine. The toothache was spontaneous, sharp, and aggravated by mastication. He also had associated history of fever and difficult/painful swallowing. He had applied herbal concoctions and taken a number of drugs without prescription. He had never been seen by a dentist or a medical practitioner before his presentation at our clinic. The patient's vital signs were blood pressure- 112/74 mmHg; pulse rate- 72 bpm; respiratory rate- 17 cpm; temperature 38.2°C (pyrexia). General examination revealed a young man who was in respiratory distress, febrile to touch, pale, and anicteric. 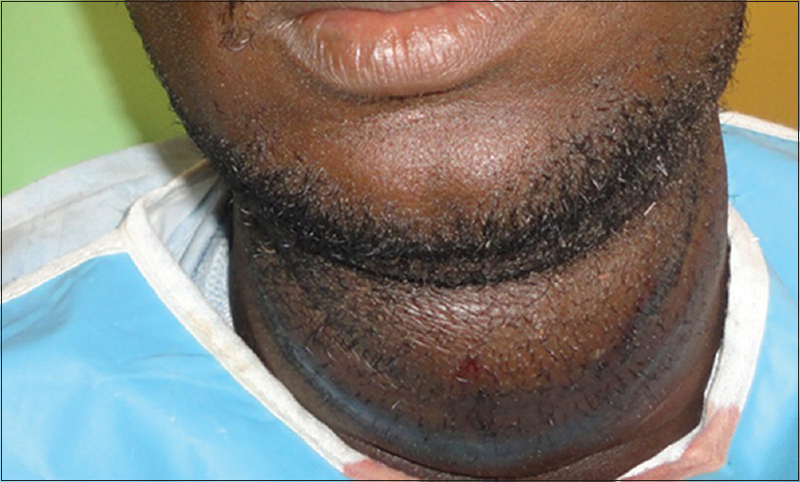 There was a left submandibular swelling with bilateral submental extension, and anterior neck involvement extending inferiorly to the suprasternal notch. The swelling was tender, fluctuant, and pitting [Figure 1]. The right chest sounded stony dull to percussion and breath sounds were absent on auscultation. Intraoral examination revealed limited interincisal mouth opening (2.2 cm), noticeable halitosis, and poor oral hygiene. The lower left first and second molars were mobile and had large carious cavities with spontaneous purulent discharge. Following admission patient, subsequent investigations such as electrolyte and urea/creatinine, total protein and albumin (TPA), full blood count (FBC), random blood glucose, retroviral screening, and microscopy culture and sensitivity (MCS) were requested. In addition, intraoral periapical radiograph, soft tissue X-ray of the neck (lateral view), and posteroanterior radiograph of the chest were done. Diagnostic needle thoracocentesis was also done, which extracted about 5 ml of purulent fluid; this fluid was sent for MCS [Figure 2]. The MCS from both the oral purulent discharge and thoracocentesis yielded normal commensals and no growth, respectively. The FBC and random plasma glucose (RPG) were within normal range. Reports of requested investigations revealed that the RPG was within normal range and retroviral screening was negative. The total white cell count was 3.9 × 103/ᶷL with granulocytes, monocytes, and lymphocytes making up 66.9%, 7.7%, and 25.4%, respectively. Results of TPA were not obtained because of financial limitations. Furthermore, the periapical radiograph showed large coronal radiolucencies on the left first and second molars communicating with the pulp chambers. 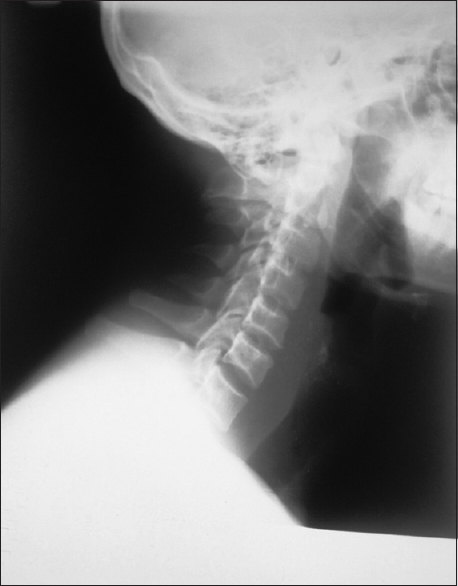 The cervical soft tissue radiograph revealed thickening of the prevertebral soft tissues while the chest X-ray revealed a homogenous opacity involving the middle and lower lung zones [Figure 3] and [Figure 4]. A diagnosis of empyema thoracis secondary to a descending odontogenic infection was made which necessitated the cardiothoracic unit's invitation. The prescribed computed tomography (CT) scan was not procured owing to the patients' financial incapacitation. Empirical antibiotics were commenced (intravenous [IV] ceftriaxone 1 g daily × 5 days; IV metronidazole 500 mg 8 hourly × 5 days) while awaiting results of the MCS. Nutritional supplements were also administered (ferrous sulfate tablets 8 hourly; vitamin C tablets 500 mg 12 hourly). IV infusion of 0.9% saline at 12 ml/kg 8 hourly for 3 days was also commenced. Under local anesthesia, the implicated teeth were extracted, and postextraction warm saline mouth bath commenced. Incision and drainage of the submandibular and anterior cervical abscesses were done under local anesthesia and iodine-soaked gauze drains were inserted and dressing placed. The gauze drains and dressings were changed daily until the 8th day when purulent discharge stopped. A right closed thoracotomy size 12 chest drain was inserted in the 5th intercostal space midaxillary line under performed local anesthesia [Figure 5]. Large volumes of purulent fluid were evacuated, and the patient was extubated on the 12th day of admission following resolution of symptoms, minimal drainage of serous fluid, and satisfactory radiologic lung reexpansion. Fluid drainage was gradual and regulated to prevent reexpansion pulmonary edema. Regular flushing of the tube with 0.9% saline was done to prevent blockage. Following satisfactory recovery, the patient was discharged after 24 days of admission. Subsequent 1-year follow-up has been uneventful. Various routes of descending odontogenic infection to the thoracic region have been identified. In this patient, it is suspected that the infection spread inferiorly through the carotid sheath (Lincoln Highway). The molars were implicated in this case, which is in consonance with reports in literature. 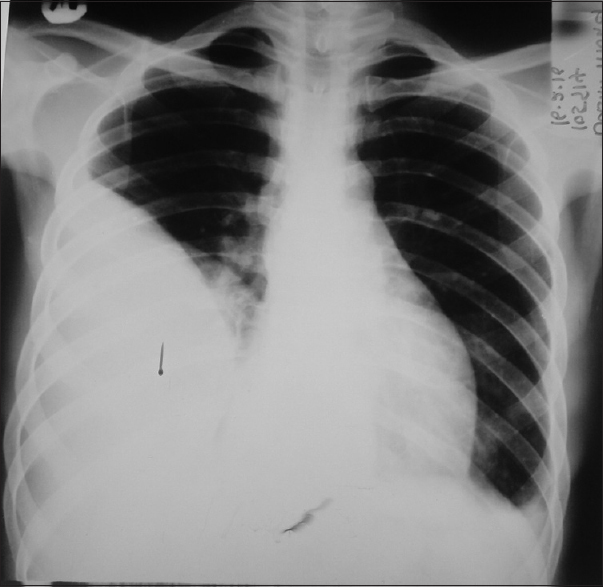 Radiological investigations are of utmost importance in the management of odontogenic infections and empyema thoracis., Both may be investigated using a number of imaging techniques, whether in isolation or combination. CT scans, cone beam CT, magnetic resonance imaging (MRI), plain radiographs, and ultrasound scans (USS) may be utilized., Particularly, in the evaluation of odontogenic infections, extra- and intra-oral plain radiographs such as the periapical, occlusal, oblique lateral, and orthopantomogram (OPG) may be used., The oblique lateral views of the mandible and the OPG are extraoral radiographs which are very useful in patients with trismus. CT scan is advantageous in radiological evaluation of these patients., Although CT scan was requested for, it was not procured by the patient due to financial incapacitation. Out-of-pocket payment is a common mode of financing health care in our environment; this often results in the inability of patients to procure requested investigations. However, plain chest and cervical radiographs were obtained in this case. 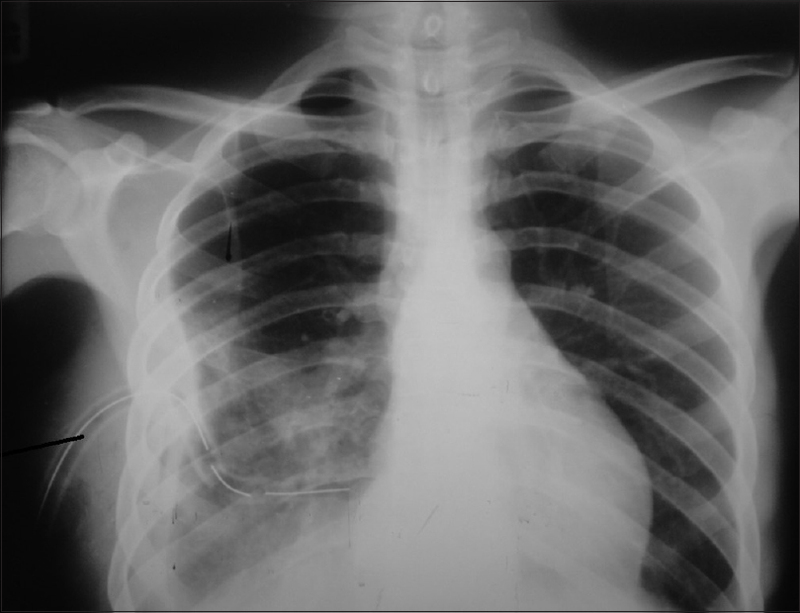 Plain radiographs are traditionally used in many health centers in management of empyema thoracis. They are cheaper and more easily accessible in our environment. However, CT scans offer better details and are useful in locating locules of purulent fluid. MRI and USS have also been utilized in patient evaluation with different success rates., In addition, USS and MRI may be used in guided diagnostic aspirations and tube placement. MCS reported no growth in this patient. This may be due to self-medication by the patient, which is a common occurrence in this setting. Furthermore, the anaerobic culture was not done because of the resource-limited nature of our environment. Ndukwe et al. in a study from southwest Nigeria reported that 88% of cultures obtained in their study on odontogenic infections were anaerobes, most of which were Prevotella melaninogenicus. Odontogenic infections are sensitive to Penicillin, Cephalosporin and Imidazole based antibiotics. Therefore, ceftriaxone and metronidazole were the empirical antibiotics used in this case until resolution of the disease. In treating these patients, underlying systemic diseases/conditions such as malnutrition, diabetes mellitus, and other immunosuppressive conditions should be treated, when present. RPG was within normal range in this case, and results of TPA were not obtained due to financial incapacitation. Nevertheless, this patient was started on nutritional supplements. Malnutrition and undernutrition are common in our environment. Despite the fact that patient could maintain his airway, blood oxygen saturation was closely monitored with a pulse oximeter and he was treated in a cardiac position. Airway maintenance, removal of the primary source of infection, drainage of abscess, early institution of empirical antibiotics, and other adjunctive care such as fluid resuscitation and pain management are of utmost importance in patient management. Various modes of draining thoracic empyema have been described. This includes the use of chest tubes, indwelling catheters, and video-assisted thoracotomy surgery (VATS). Indwelling catheters may be used on an outpatient basis. However, the tubes are often of small caliber and require frequent flushing to prevent blockage. VATS is less invasive and can be directed at specific loci, but not widely available, especially in developing, resource-limited countries like ours. Although VATS has been reported to be associated with lower complication rates than drainage by tube thoracostomy, it was stated that 20% of patients still required open thoracotomy owing to failure of VATS. A unidirectional chest tube with underwater seal was utilized in this case. It is cheap and easily available. Odontogenic infections may lead to severe morbidity and mortality, especially if poorly managed. Although empyema thoracis of odontogenic origin is rare, the chest should be adequately evaluated in patients being managed for moderate/severe odontogenic infections. We wish to acknowledge the management and staff of the Usmanu Danfodiyo University Teaching Hospital, for their support, especially in data retrieval for this manuscript. Agbara R, Obiadazie AC, Ediagbini S, Ernest I. A fatal case of empyema thoracis: The price for underestimating odontogenic infections. Oral and Maxillofacial Surgery Cases 2016;2:22-6. Juretic M, Belusic-Gobic M, Kukuljan M, Cerovic R, Golubovic V, Gobic D. Mediastinitis and bilateral pleural empyema caused by an odontogenic infection. Radiol Oncol 2007;41:57-62. Davies HE, Davies RJ, Davies CW; BTS Pleural Disease Guideline Group. Management of pleural infection in adults: British thoracic society pleural disease guideline 2010. Thorax 2010;65 Suppl 2:ii41-53. Brims FJ, Lansley SM, Waterer GW, Lee YC. Empyema thoracis: New insights into an old disease. Eur Respir Rev 2010;19:220-8. Ibikunle AA, Taiwo AO, Gbotolorun OM, Braimah RO. Challenges in the management of cervicofacial necrotizing fasciitis in Sokoto, Northwest Nigeria. J Clin Sci 2016;13:143. Ndukwe KC, Okeke IN, Akinwande JA, Aboderin AO, Lamikanra A. Bacteriology and antimicrobial susceptibility profile of agents of orofacial infections in Nigerians. Afr J Clin Exp Microbiol 2004;5:272-7.